Want it by Thursday 25th April? Order within 16 hours, 54 minutes and choose Special Delivery 24 Hour Delivery (Signature Required) at checkout. The Apsley Wax Jacket forms apart of the global expeditions collection, inspired by Arctic explorers and designed with robust hard-wearing features. Beautifully produced from 100% Waxed Cotton with the most luxury Sherpa fleece collar. 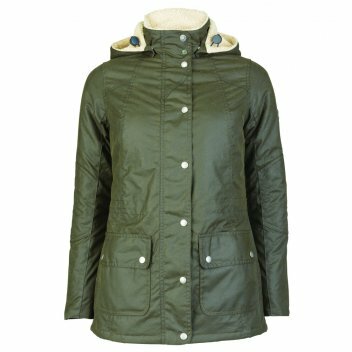 The handy detachable hood, a zip-snap close fastening and outer pockets are great for the winter months for added protection. The Apsley Wax Jacket features quilted elbow patches and a Union Jack badge trims at the side sleeves for a stylish and beautifully finished look. It's gorgeous! Fits perfectly, is the best quality and the best price too.